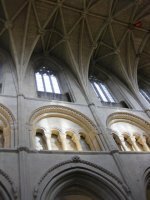 The Swindon Interfaith group meets on a regular basis and brings together representatives from various religious faiths that meet in the Swindon area. The faiths represented include Christian - both Protestant and Catholic, Sikh, Muslim, Buddhist, Baha’i, Unification church, Jewish. On Wednesday the 24th of October, The Swindon Interfaith group organised their annual event to coincide with one world week. And what a true delight it was. First of all we were treated to a small sketch by the Baha'i faith. One of their number acted as a very ill’ humanity’, who had all hatred, religious bigotry and racial hatred removed from her and made an amazing recovery! Secondly, the Swindon interfaith Christians had written a poem which introduced us to various Christian leaders down the centuries, starting with Jesus, including St Francis and John Wesley and Martin Luther King. We were treated to inspiring quotes from each of these people. The Muslims then took to the stage – quite literally as a guitarist and drummer accompanied a gentleman who talked to us about the Sufi poet, Rumi. Rumi was a mystic and mystics place the emphasis on the spiritual experience rather than on any doctrine or dogma. Therefore, whilst they may be grounded in a particular religion, they cannot feel separated or strongly identified with such labels. The beautiful Rumi poem, Only Breath, was read in both Farsi and English. Next we had the Swindon interfaith Hindu contribution where we had a small explanation about a prayer which dealt with letting go of the 10 faces of the ego (I hope I've got that right). We were treated to a beautiful chanting rendition of this prayer, and all joined in with the clapping. The Buddhist (there was only one :-) ) was next. He invited us to think about how we all feel separate, but that we all know suffering and pain. “Don't we?” he asked, and got an affirmative murmur from the audience. He asked us to think of our current pain or suffering and then imagine it as just part of an huge ocean of pain or suffering. In this way he encouraged us to switch our focus. Pain and suffering is often something which isolates us and makes us feel more separate. With this image, it was something we could use to allow us to know our connection with others. Then came the unification church where a father and his daughter sang "you lift me up". Finally, the mayor of Swindon was invited to say a few words, and spoke with gentle passion about how each month it is his job to welcome people who have taken British nationality, and how he informs each one that they are in a country where religious freedom is upheld as a right. I am struck each time I intend an interfaith meeting by the profound beauty of being in a room with people of different faiths, who acknowledge the differences, and inform each other of the differences, in trust that their words will cause interest, not of division. We were made to feel very welcome in the Islamic civil centre, and I am already looking forward to attending next year's event. 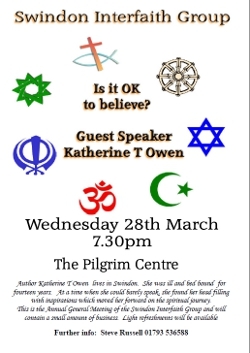 My profound thanks to all who organised this Swindon interfaith group meeting and all the others. Click to read more about or buy It's OK to Believe. Katherine lives in Swindon. She was ill and bedbound for fourteen years. 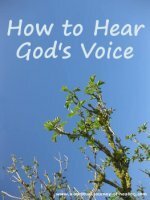 At a time when she could barely speak, she found her head filling with inspirations which moved her forward on the spiritual journey.